Glass and UV-passing acrylic lenses play an important role in ultraviolet (UV) lighting. Both are applied to control the transmission of specific wavelengths from the fixture to the target area. When used for windows, the panels offer protection from harmful UV bands. Below highlights the advantages of the materials and their applications in UV light mitigation. Glass can help block UV radiation and let specific UV bands through, depending on the needs of the application. For example, window glass is known to block UV light in the B spectrum (UVB), while allowing UV light in the A spectrum (UVA) to pass through. By comparison, UVB wavelengths range between 280-315nm and UVA bands range between 315-380nm. In industrial applications, UVB is applied to projects that require moderate light penetration, such as general paint curing. On the other hand, UVA is useful for curing deep layers, such as pigmented lacquers and thick varnish. In the dental industry, coated glass was used to isolate specific UV bands to polymerize composites. This practice was eventually phased out with the introduction of blue light technology. “In the original design a UV blocking glass was used to direct the desired UV band toward the emission end of the tool. In the current designs for these devices it is likely that a UV blocking glass is used to direct the harmful UV radiation away from the emission end of the tool,” explained Abrisa Technologies, a leading glass optics manufacturer. There are several types of window glass that offer different levels of UVA protection. Clear glass lets around 75 percent of UVA light to pass through. By comparison, tinted and reflective glass types block more visible light, which may reduce clarity under low light conditions. One should consider that tinting decreases UVA penetration by up to 30 percent. Laminated glass and UV-blocking coated glass offer superior UV protection at 95-99 percent efficiency. Laminated glass is composed of two layers of glass with a plastic film in the middle for added protection. This type of panel can be found in commercial buildings, such as airports and museums. Halogen lamps emit a broad spectrum of light, including UV. By design, the fixtures rely on quartz for its heat resistant properties. Unfortunately, quartz is not effective in blocking UV radiation, and usually allows considerable levels of light to pass through. As a solution, manufacturers apply a special type of quartz with UV-blocking additives. Another option includes the application of heat resistant glass, which is used to enclose the quartz bulb. This offers superior protection against harmful UV bands. 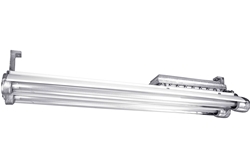 Fluorescent lights are also prone to emitting UV light. During operation, an electrical discharge stimulates gas- neon or mercury vapor in argon. This reaction causes the emission of UV radiation. A protective dye or phosphor coating covering the bulb absorbs the harmful UV bands and allows visible light to pass through. Infrequent exposure to fluorescent lamps is not deadly to humans; but persistent exposure has been linked to various skin-related medical conditions. “Under CFLs, the experiments showed cells stopped growing and changed shape. Dermal fibroblasts suffered worse than keratinocytes, since they are usually not exposed to light. This indicates these bulbs can damage skin in several layers,” said Umair Ifran, from Scientific American. In industrial settings, acrylic glass comes with numerous advantages over mineral glass. The robust material transmits up to 92 percent of visible light, compared to 80-90 percent for mineral glass. With high thermal conductivity rates at roughly 0.19 W/mK, acrylic glass is less prone to condensation and heat loss or wastage. At the surface, the material is softer, and can withstand polishing when removing blemishes or light scratches (this cannot be done with mineral glass, which would normally call for a full panel replacement). The density of acrylic glass ranges between 1150-1190 kg/m3 and offers exceptionally high impact strength. It will not shatter, making it ideal for extreme conditions, where glass breakage could lead to fatal injuries, such as submarine windows and manufacturing facilities that handle explosive materials. This type of glass filters UV light at bands below 300nm. To promote UV light absorption, manufacturers may apply additives to the material.